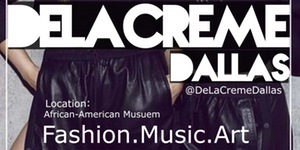 DelaCreme Dallas -Art, Music & Fashion Showcase In Dallas Tx, at the African American Museum located in the Fair Park. to be a fashion designer, singer, dancer, poet, artist, model, businessman or woman, or just want to be in an atmosphere just to experience all of these beings in one place, this event is for you ! I had the opportunity to interview the amazing founders of this event and soon you will be able to see exactly why they are imperative to the culture of Art in Dallas. This Saturday if you are in Dallas, YOU have got to be in the atmosphere, you don’t want to miss this! I will be there, live tweeting/Instagram posting and capturing amazing moments of the night and soon will post exclusive behind the scene interview’s with vendors/sponsors/artist’s and so much more! !